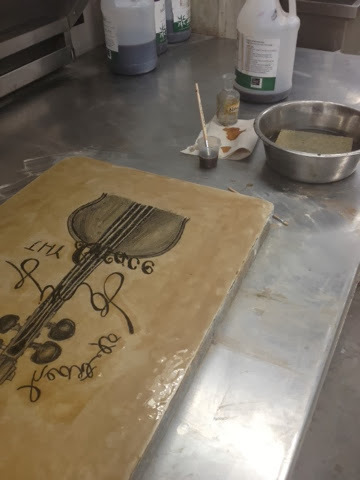 After doing my post on "A Day in the Life," I thought it would be fun to show the behind the scenes of a project I did for my sisters--printmaking through stone lithography. 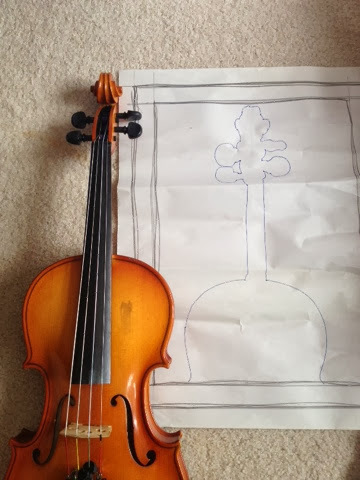 I claim to be no expert and this was my first (read, trial and error and error and error) go at it. It is a very demanding process but fun and proved to be a good workout. This is a process by which you physically remove any and all grease deposits in the stone that resulted from previous drawing. The stone must be coarsely grained and then slowly polished with finer and finer grits until it has a smooth but toothed surface. You must take care to clean hands, stone, levigator, and surrounding surfaces when changing grits to prevent from unwanted scratches on your stone. This is my stone...wet with grit sprinkled on it ready to swirl (the very heavy) levigator in order to slowly remove grease and level the stone. 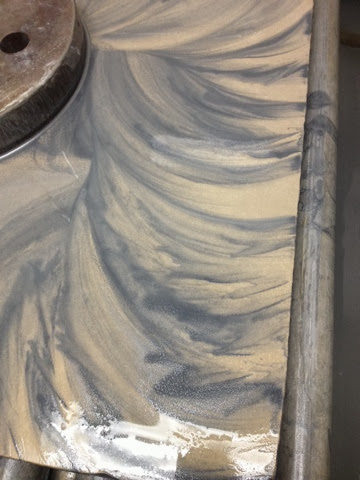 After graining FOR HOURS, you begin to take joy in the little beauties...such as this pretty swirl. As I said, this is a workout. Now if only I had remembered to bring a protein smoothie....I might as well be getting swole when doing this, right? 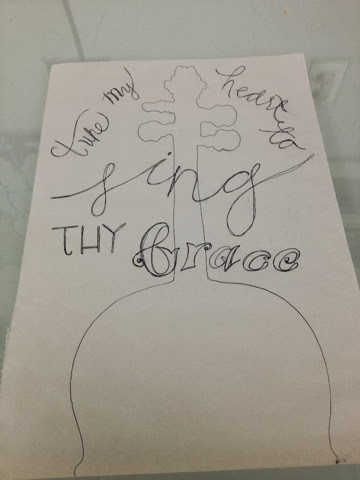 Then, I drew my design (quite dark because I needed to see it through the back of the paper) on a large sheet of paper to be transferred onto the stone. 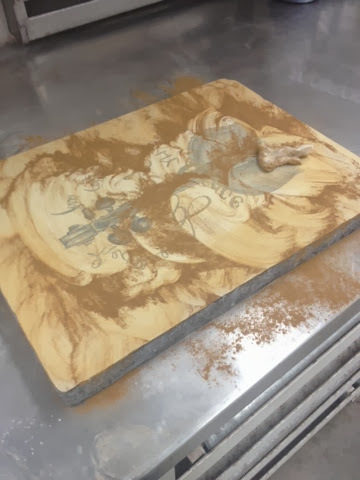 The transfer will appear backwards on the stone as we want it to PRINT readable. Now begins the drawing with grease crayons. I purchased my crayons from the U of M bookstore and clearly they had been collecting dust for a while...with continuous small breaks and clumping, I was not very pleased with the quality of the crayons. If I had had more time, I would have loved to replace them and begin again but that would have meant more graining...and we all know how most would feel about that. 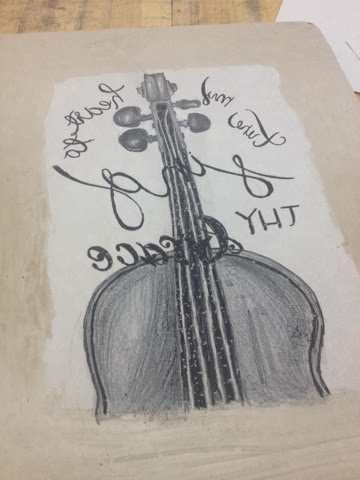 The boarder around the design was created with straight Gum Arabic in order to have a place to rest my arm when drawing. 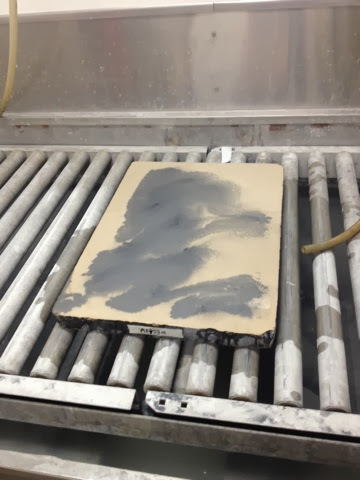 As the stone produces any image created from grease, that means if I were to smudge my hand across the surface, I could accidentally create a smudge of hand grease that would end up printing on my image. This is a pretty finicky process and but can produce beautiful results when handled with care. 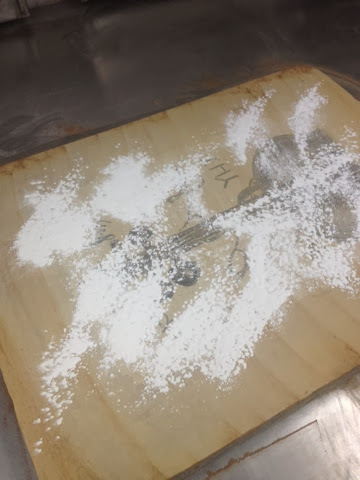 Then we covered the image with rosin, a cinnamon-looking powder. I believe this was to soak up any extra grease not attached to the stone. Then cover with talc. One thing for sure, this process is not speedy. There seemed to be a million steps and I certainly cannot explain why each was necessary...I just figured why not, eh? Next comes the fun part...or daunting part! 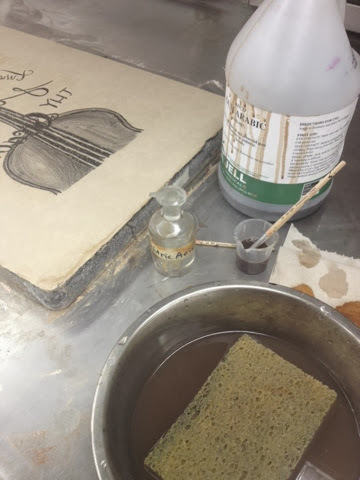 Mixing nitric acid with the gum arabic to create an etch of the drawing in the stone. 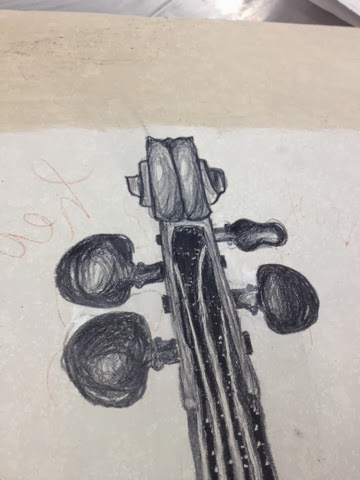 Each part of the drawing (that you wanted to be darker, lighter, medium) needed to have a specific etch (mixture of nitric acid and gum) created...we were given a rough table of how many drops of acid to add to achieve which strength of etch. Then cover the whole stone with the lighted etch and buff that into the stone with a cheese cloth and let stone sit for 90 minutes, at the least. Have I mentioned this was a lengthy process? And we haven't even gotten to the printing? Uffda. Once the stone has had its alone time, we are finally ready to roll up! This step of the process if for removing the drawing materials and preparing it for printing. 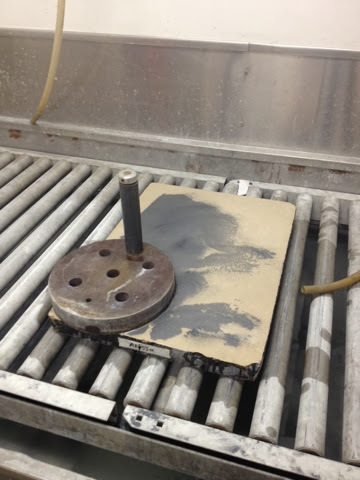 First, wash out drawing with lithotine. 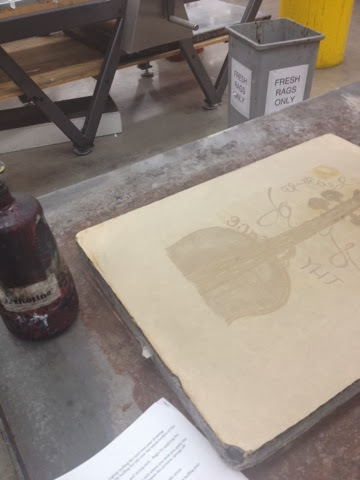 Then, rub stone with asphaultum printing base (a thin tar-based liquid which will help your stone take the ink). By this step, I am fairly convinced all printmakers are actually chemists. Our goal after covering the stone with these scary-sounding liquids is to reveal a ghost image...that is to say, an image of your design without any color--only open areas of the stone for the ink to settle into. 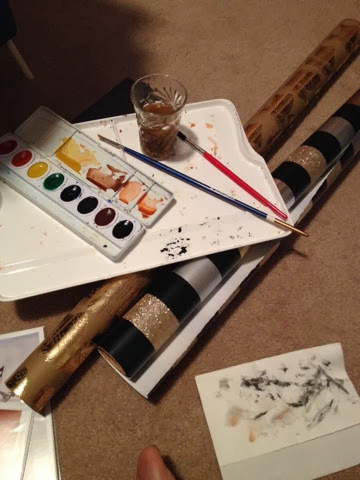 Then we can roll the stone with our normal sponge/ink process...that, my friend, is a process in itself and therefore I'm just going to convince myself as though you know alllllll about it already. 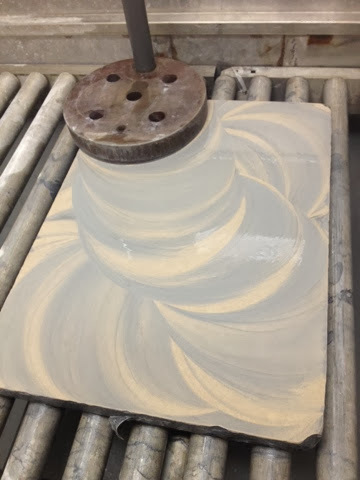 Once the stone is full, dry the stone with a leather fan (aka a wooden rod with a piece of leather attached at the top...) Now start swirling--round and round. Just in case you were losing those arm muscles. Can you believe I made it out of this class alive?! Well, the process was well worth it! 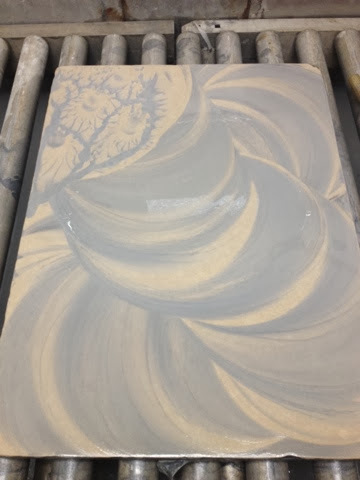 After letting the stone sit for 90 minutes, then I rolled the stone up and began printing. I printed two a bit lighter because I wanted to personalize them for my sisters as a gift. Below is the heavier printed edition...I'm thinking of still adding color to these but it will probably turn out a bit more faint of color than the lighter printed variable edition. I had completed these editions in late spring and was secretly waiting until Christmas to present them to my sisters. If you know about me and gift-giving, you know I don't like having to wait. I want to shower you with gifts as soon as I make the gift or purchase it. 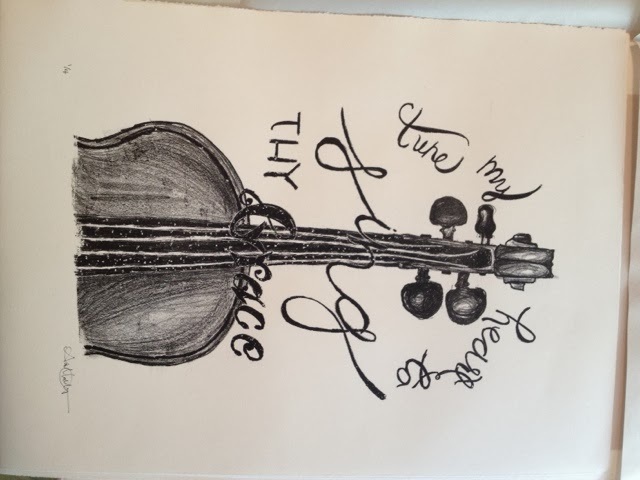 Needless to say, keeping this a secret may have been my greatest accomplishment with this project. I have never really watercolored but decided to give it a whirl for this project. 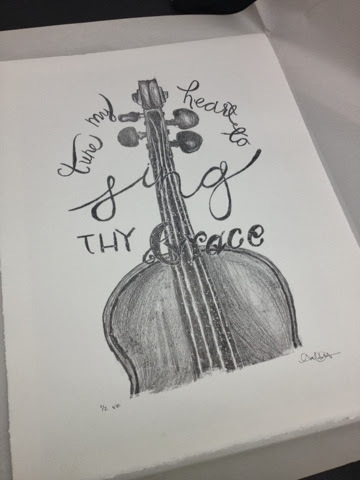 I thought the delicate addition of color would be prefect to not take away from the original print. Finally, the print was completed!! 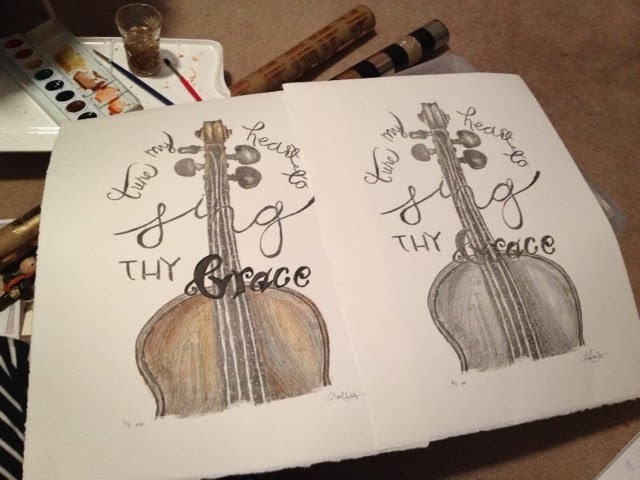 On the left is the watercolor/print edition finished and on the right is the lighter print before the water color. I am kicking myself for not getting a better photo of the print a bit closer...but at least not both prints are being sent to Canada. I guess I'll have to visit sissy in St.Paul for a quick snap. Hope you enjoyed this lengthy post! 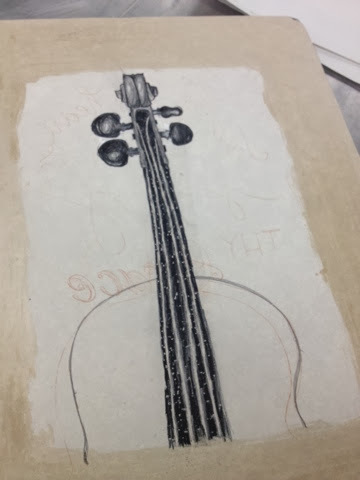 It was a fun process to learn but ever so thankful that alternatives to lithography were formed...I think I'll be sticking to photo-litho from now on. Wishing you all the best in the (fast-passing) NEW YEAR!